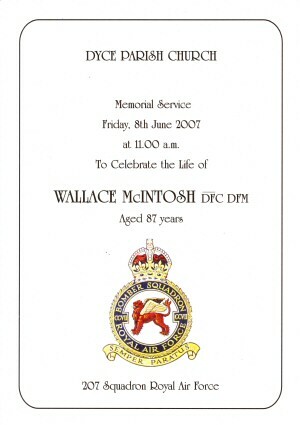 On 4th June 2007 we learned of the death in hospital in Aberdeen that morning of Wallace McIntosh DFC* DFM, aged 87. 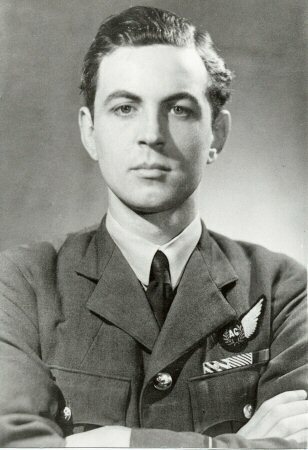 Wallace's extraordinary life, which included two tours on 207 Squadron (in the crews of F/O Fred Richardson and Wg Cdr John Grey) and the accolade of top scoring gunner on Bomber Command, was set out in the book Gunning for the Enemy by Mel Rolfe. It is intended to provide a dedicated section of the 207 Squadron RAF Association website in honour of Wallace, also representing, as he would surely have wished, his fellow Air Gunners. Our condolences go to his daughters Anne, Mary and Frances, son James, son in law Joe and his grandson Alistair, his sister Frances and other members of the family. Those present at the Dinner at Linton on Friday had all signed a menu card for Wallace. 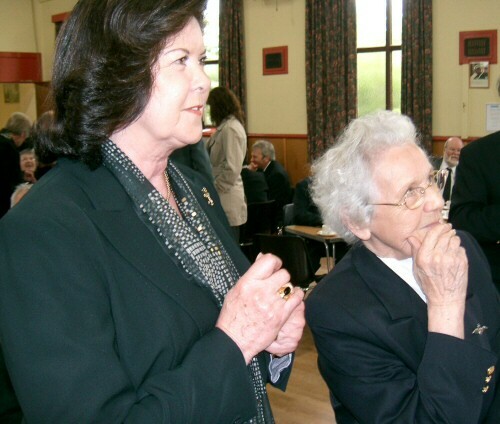 Wallace's memorial service took place at Dyce Parish Church, Victoria Street, Dyce at 11am on Friday 8 June. 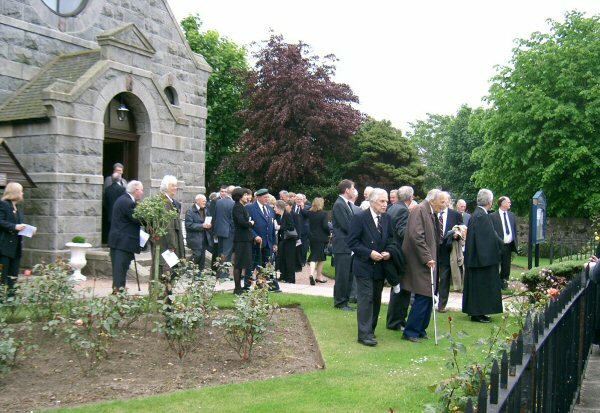 It was Wallace's wish that his coffin not be present at his Memorial Service. There was a private cremation service in the afternoon. It was family flowers only. Donations can be sent to Dyce Parish Church (152 Victoria Street, Dyce, Aberdeen AB21 7DN) or to the RAF Benevolent Fund. 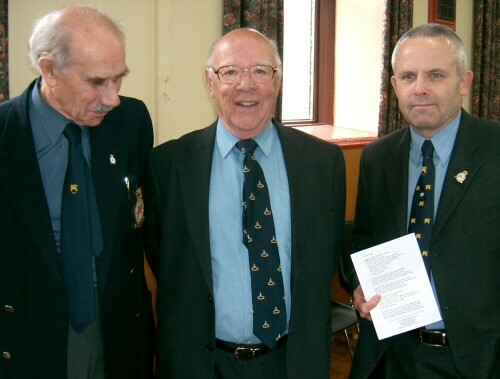 The Association was represented at Wallace's Memorial Service by two members of the Committee and some members. The Officer Commanding RAF Lossiemouth represented the Royal Air Force and there was a flypast after the memorial service by a 12 Sqn Tornado GR4 from that station. 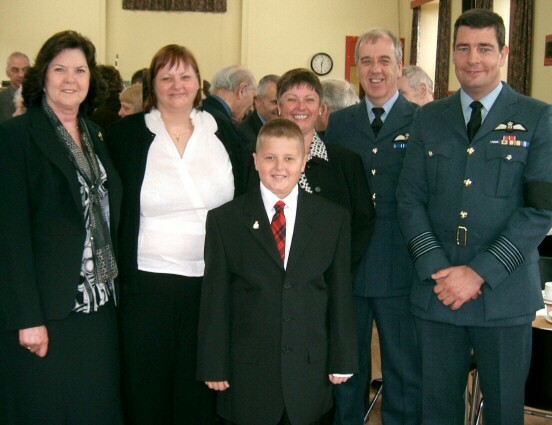 The Aircrew Association and RAFA were well represented. The service was taken by the Minister of Dyce Parish Church, Rev Dr Russel Moffatt. My friends today we celebrate the life of a truly remarkable man. Wallace McIntosh was a great character. I have often stood in this situation saying of the deceased that the last thing they would want is any fuss. That does not apply to Wallace! The last time I saw him in hospital he instructed me to give him a good send off. He said, Moffat,youll know what to do No pressure then! He always called me by my surname and the only time that has happened in my life was when I was at Police College being addressed by the PTIs who were all ex-Marines or Paras and I was usually in trouble. So when Wallace addressed me I always felt like standing to attention! That said, it is easy today to do justice to Wallaces life for there is so much to remember and pay tribute to. However, since hes probably watching we better get it right! It has become somewhat of a cliché to refer to a person 'living their dash' (meaning the little symbol on gravestones between the year of birth and year of death) but it is very appropriate today. Wallace lived his dash with courage, conviction and energy. They say that time is not measured by the years that you live but by the deeds that you do and the joy that you give but in Wallaces case we have the best of both worlds because he not only lived a long life but an incredibly full one. His time on earth was, in every sense, an 'adventure', packed with achievement and many rich and varied experiences. Therefore, the family have much to remember with pride and gratitude. It is at this point that I would like to invite Mr Ken Williams, a close friend of Wallace, to present the Eulogy today. Wallace McIntosh was born 87 years ago, on the 27th March 1920, near the small village of Tarves in Aberdeenshire, Scotland. It is of interest that some four or five years ago, the Bank of Scotland undertook a survey wherein they requested their customers to nominate the names of Great Scots of the past or of the present. Amongst those nominated was Wallace McIntosh - War Hero. The list also included such illustrious names as David Livingstone, Logie Baird and Robert Louis Stevenson. Inclusion within a group such as this was indeed an honour and "public recognition of his worth". When asked by Ann, Wallace's daughter, if I would present the Eulogy at today's service. I was of course honoured to accept, whilst at the same time. somewhat overawed at the prospect. I have known Wallace for in excess of thirty years, both as a colleague in the workplace and more particularly as a friend. His story is I feel sure known to each of you present at this service today and by now, to many people throughout the United Kingdom, his obituary having been "featured" in most of the major newspapers, including the Daily Telegraph, The Times, The Press & Journal, The Daily Mail and The Daily Express. The list also includes The New York Times and The Sun Sentinel in Florida USA. It is indeed seldom that such a high level of coverage is given to the event of a local funeral. 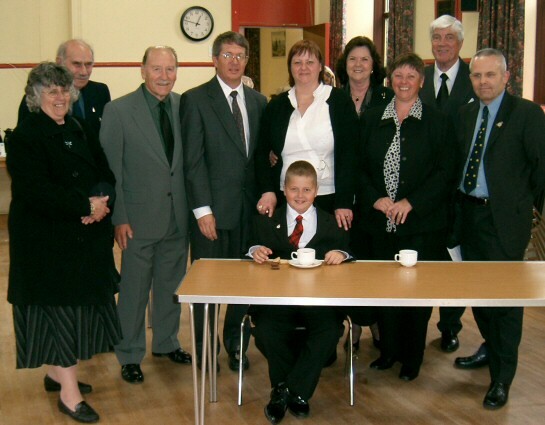 In brief, Wallace was brought up by his Grandparents. His Grandfather was a stockman who was often too ill with rheumatism to maintain steady employment, which fact ensured the constant need to move around Scotland, particularly the North East, in search of work. Born into a hard world where agricultural itinerant workers were placed at the bottom, of what was at best, an extremely rickety employment ladder, Wallace in the formative years of his life was to experience both hunger and cold, whilst the families' lot was to accept years of grinding hard work and poverty. Nevertheless, his Grandmother tried to ensure that his clothes although often worn out were pressed and clean. She also saw to it that Wallace attended school wherever their travels took them whilst constantly telling him that "with education he could well better himself in the days to come". He attended 14 schools, prior to leaving at the age of thirteen to take up full time employment. Wallace learnt at an early age to accept responsibility and the determination to work hard to earn a wage, to put food on the table - even by poaching if the opportunity arose that being perhaps where he developed a keen eye and fast reactions. Those early years were to form the foundation of his character in the years to come. That he was brave and resolute has been well proven by the award of the DFM when he was a sergeant and the further awards of the DFC and BAR when a flying officer. The accuracy of his return fire in the face of many attacks resulted in the probable destruction of at least two fighters and had on all occasions enabled his Captain to avoid serious damage to his aircraft, thus furthering the confidence of his crew and the success of their mission. His great sense of responsibility keenness and determination to improve his own efficiency have set an admirable example to the rest of his Squadron. He was to become the most highly decorated Rear Gunner in the R.A.F. and to complete 55 operations in total, during his service as a Mid Upper and Rear Gunner. Wallace was to remember the lessons of his early years and carried them through his years in the R.A.F. and then into his time in Commerce where he always showed a diligent attention to the job in hand and a clear recognition of his responsibility to his staff whilst being very much an active member of his management team. He had a willingness throughout his life to learn constantly and to pass on his knowledge to those around him. He was keen to instruct and train his staff - he never suffered fools gladly. He was well known to offer advice on any subject on some occasions. You may not have wanted the advice - but you got it anyway. However he never took exception to your not taking it. Wallace had a great sense of humour which never let him down, being always ready with a joke or some other witticism. Even under the most difficult circumstances he was always ready to offer a helping hand to a colleague at work or indeed to a passing stranger. He was a great family man, taking flowers each week to his wife Christina and never forgot to take sweets or chocolate for his children which he continued to do even as they became adults. He loved his family and his children. Ann Mary and James have all grown up to be a great credit to both Tina and himself Wallace was a Scot - and very proud of being so. He loved Scotland particularly the North east where travelling with him I often felt he knew every road, hill, glen, and stream and their names off by heart. Even more did he know, like and appreciate the people of the area particularly the farming community where his intimate knowledge of the agricultural way of life allowed him to make many friends amongst those he served so well within his career in the Agricultural Machinery Trade whilst working with Barclay Ross and Elbar Farm Services in Aberdeenshire, Angus and Moray over a period of many years and in which areas he made his home. A very well kept man and a very well liked man Wallace loved to travel be it in Scotland, England, Europe or even further afield. He loved nothing more than to get away in his car and just visit local places he always said "People and Places are amongst the most interesting of things in life". Added to his love of travel was his ability to speak to anyone he met with total ease. Place Wallace in a room with fifty people he had never met and leave him there for an hour and he would know at the end of that time some 60% of those people to speak to, and you could be sure that all of them would know Wallace. Wallace's daughter Ann tells the story of the only time she ever saw her father lost for words, which occurred when he was on holiday with her family in Florida. She and Wallace decided to go on a little trip together as he would put it, to see the country and meet the people. They arrived at a small town in Alabama, which was called of all things Aberdeen. In the town square was the local store and sat outside on the steps were a number of the local characters complete with fur hats, beards, long-eared dogs and guns. Wallace bounded out of the car made his way through the gathering on the steps and into the store. Upon seeing the storekeeper he said in a loud voice "Where do you think I come from?". The store keeper thought for a moment looked at Wallace and said "Aberdeen, Scotland". Wallace replied "How do you know that?" and after a short pause the storekeeper said "I recognised your accent. I've got a sister who lives in Stonehaven". People and Places. Sport was a thing Wallace much enjoyed. A keen supporter of Dundee United for many years, he was to be found glued to the Television on Saturday afternoons and on any evening when a game worth looking at was on the box. A proud man - always smart and well turned out, he kept very much aware of both local and world events which he followed closely and was ever ready to discuss often "putting the world to rights" in recent years on Sunday evenings in the company of his good friends and next door neighbours. Wallace was to be re-connected with the R.A.F. upon joining in 1985 the newly formed 207 Squadron R.A.F. Association this having been the Lancaster Bomber Squadron in which he flew during his operational service. Never having been only a "joiner" he quickly entered into the activities of the association and took an active part in promoting it's intended aims. He had the most amazing memory and was capable of remembering names, dates, places, and incidents from many years previous, which was to assist many members of the Association to trace friends and family from the war years. One of his most closely held connections lay with the Airfield at Langar in Nottinghamshire, from which he flew his first tour of operations. As it was an intention of the Association to implement the construction of a Memorial at Langar, with his usual enthusiasm Wallace, in 1994 implemented a Sponsored Marathon Tour, taking in over 60 former R.A.F. Bomber Command Airfields and covered over 3,300 miles in one month, encompassing Yorkshire, Lincolnshire, and East Anglia succeeding in raising a significant amount of money in this endeavour. 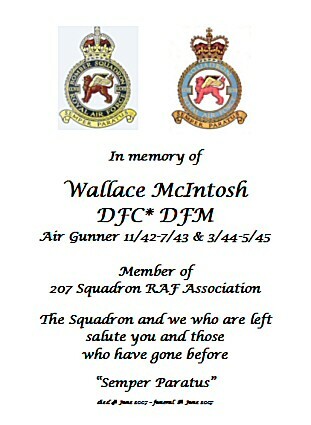 Recognition of the part Wallace McIntosh played during his years of service in the R.A.F. 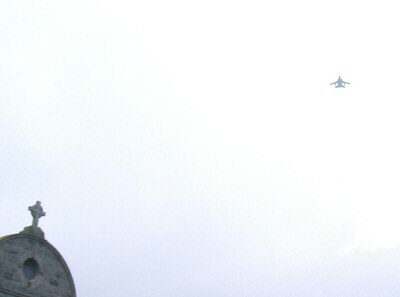 and within the Association it is recognised here today by both a Fly Past arranged by R.A.F. 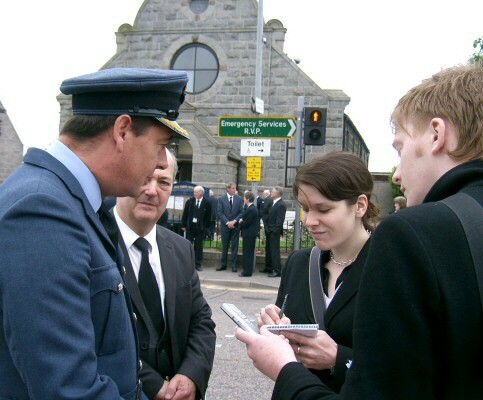 Lossiemouth and also by the presence of a number of senior R.A.F. 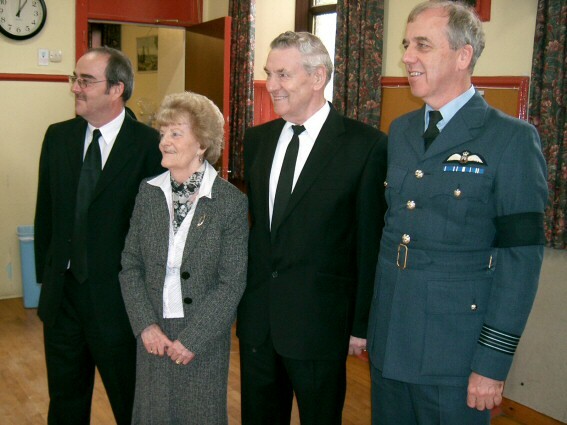 Officers and senior members of 207 Squadron Association. Honour of this nature is not lightly bestowed other than upon persons of a truly meritorious worth. Wallace will be sorely missed by those who knew him and the world has lost a "Hero and a Gentleman", He fought the good fight right to the end and he did not go easily into that dark night, although his passing, in the end was peaceful and in the company of his family. The memory of Wallace McIntosh will remain with us for many years to come. Now, a change of tack. We have looked back in remembrance, but now we look forward in faith and hope. Wallace was someone who had a simple down to earth faith even if, characteristically of the North East, this was something he considered a private matter. I was once being flown in a private jet from New York back to Britain and was invited into the cockpit by the Pilot to watch the sunrise. We were flying over a sea of clouds and there in front us, coming up from under them was this glorious ball of fire. A spectacular sight. I remember thinking that somewhere else in the world, on the other side, someone was probably in awe watching a sunset. The difference between a sunrise and a sunset depends on where you are standing. For us it is a sunset as Wallaces light has gone down but it has not gone out. It simply shines somewhere else, on the other side. Therefore, today despite the sense of sadness and loss, this is a 'graduation ceremony' for Wallace. He has, to change the metaphor, served his apprenticeship well and has moved on to the next stage. We were privileged to have known him and our lives are the richer for that. 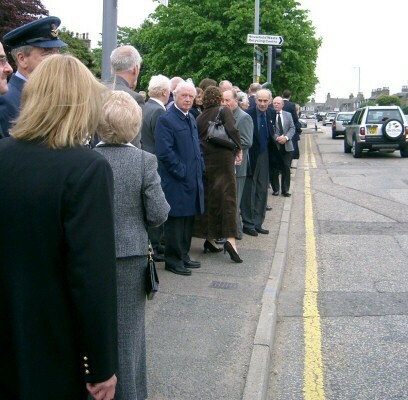 The Committal Prayer was followed by the final Hymn Onward Christian Soldiers after which we were invited to wait outside the church for the flypast by a Tornado from RAF Lossiemouth. We were told the Tornado would approach more or less from up this road. 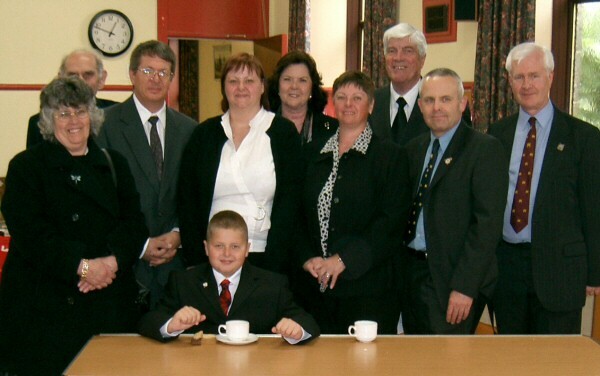 Some of the the MacInnes family, Ken Williams and Alec White can be seen. the Navigator was in contact with the Tornado. I believe my first post-war meeting with Wallace was at our 207 reunion at The Petwood Hotel in Woodhall Spa, which brought together, thanks Ben Lyon and Ron Winton, many old comrades of the Langar and Spilsby eras. We became firm friends and visited each other regularly. We had both flown with the Canadian gunner Larry Sutherland, so were able to entertain him north and south of the border when he was able to come over, and, in turn, be entertained by him when we visited him in his adopted home in Florida. Wallace loved to travel ... one much talked about trip being a solo visit to Poland which involved some rather long-distance hitch-hiking! Whenever I went to stay with him in Dyce we would be off - to Skye, The Orkneys, the Edinburgh Tattoo. He knew many of the farms and and farmers from his days in the agricultural business, and we would tour many out of the way places. When he came down to Bedfordshire it was often by a scenic route,which, on one memorable occasion, included the whole length of the Welsh coast! Then we would be off - to Cornwall or Hayling Island (a Naval gathering - don't ask!) or, with his old friend Ken Williams driving (and wishing one of his two old air-gunner passengers had been a navigator) to the Continent. Apart from Association trips we visited Holland with Ken, Bill Verralls and his son Peter, touring airfields and museums and visiting some old friends of mine from early Air-Gunners' trips to Dronten, New Zealand (to see my old skipper Doug Smith). We also went to Italy in the company of Ken Williams and Norfolk members Peter Valleley and Peter Coady, primarily at the invitation of a local historian to visit a Power Station Wallace had bombed at Cislago, but also to evaluate the local vino. Our last trip, last summer, was a cruise down the Rhine! Wallace was very aware how lucky he had been to come through two tours, and was determined that those who didn't make it were never forgotten. Consequently he was happy to give talks to various groups and particularly liked to talk to young people. 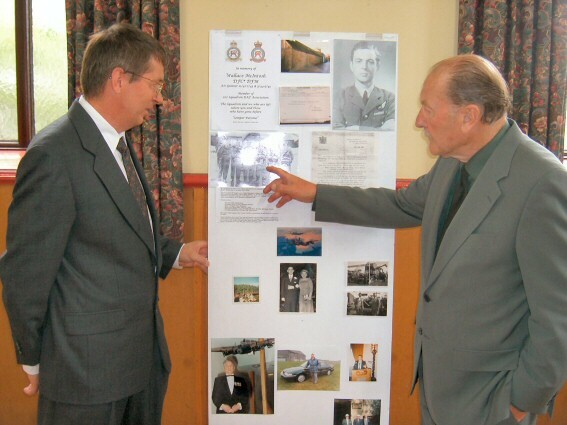 When the Association was raising money for its Memorials he did his Grand Tour of Airfields, not only to raise money towards the appeal but also to raise awareness of 207 Squadron Association and its proud history. He also made sure that, when he signed a copy of his biography Gunning For The Enemy a donation was made to our funds. 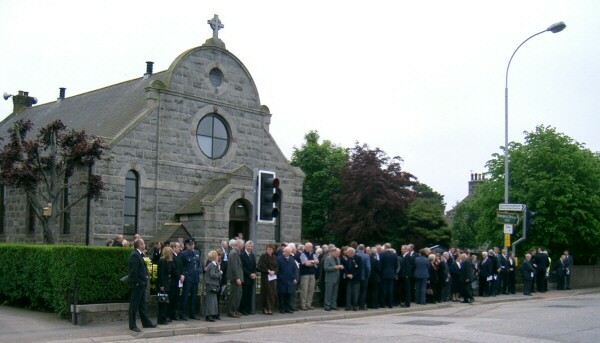 My good friend died on 4th June 2007, and my family and I were very proud to attend the Memorial Service on the 8th June in Dyce Parish Church. Ken Williams and I were very honoured to be invited by Anne, Mary and Frances to the private cremation later that afternoon. I have written here only of my personal remembrances of Wallace. Most members will be aware of Wallace's war-time deeds - he would have been very disappointed if they were not! I was saddened to learn of the recent death of Wallace McIntosh ("Mac" to his fellow crew members) who was the Rear Gunner in Wg Cdr Grey's crew during flying operations with No. 207 Squadron at RAF Spilsby in 1944. He was the most experienced in bombing operations in a crew in which the rest of us were largely novices in the business of operations over Europe. We were confident of his skill and courage in adversity and I think were thereby encouraged to get on with our individual tasks despite the drama that might have surrounded us. I remember the clarity and coolness of his advice to the pilot when we were under attack and the close co-operation between Rear and Mid-Upper gunners in those situations. In contrast, during the long and often boring stages of a flight, his timely interventions made us fully aware of his presence in the rear turret. In off-duty periods he was a friendly and lively companion who did much to bond us into a cohesive unit. We were a young and disparate bunch at the outset of our tour but under the command and guidance of Wg Cdr Grey, coupled with Wallace's experience as an old hand, I think we can say we lived up to the high standards of the squadron. We were very fortunate to have Wallace McIntosh with us. His exploits have been recorded in the Squadron's history and, in that context, I am sure they will be long remembered. 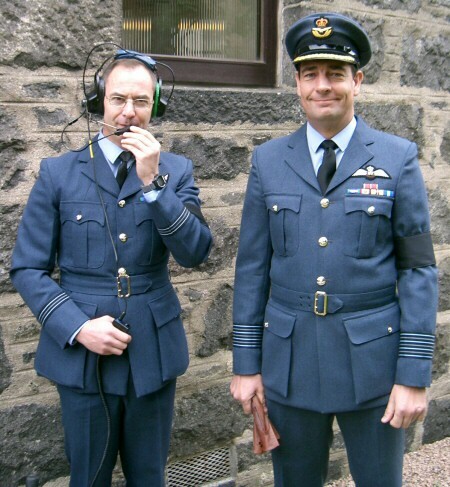 I was privileged to join the crew of Wing Commander John Grey on 207 Squadron to complete my tour of operations which had begun on 61 Squadron. It soon became clear to me that each member of the crew was most competent in the tasks allotted to them and none less than Wallace McIntosh, the Rear Gunner, who had established himself as an outstanding hero, having completed one tour of operations and volunteered for a second tour. He was fired by a great enthusiasm for flying and in his preparations for each sortie he was meticulous in checking each item of his equipment to ensure it would work satisfactorily when needed in any possible crisis. This undoubtedly contributed to his success as a gunner and explained his successes at this task. His enthusiasm was infectious and contributed in some large measure to the unity of spirit displayed in his crew. When any crisis did present itself, he displayed calm and proceeded to act to relieve the situation, as was evidenced when the aircraft was hit on the raid on St Leu de Esserent. Together with his fellow gunner Larry Sutherland they gave an assurance that any attack on the aircraft by enemy fighters would be hotly contested and warded off. The awards of the DFC and bar and the DFM are testimony to his continued bravery and skill as a gunner. 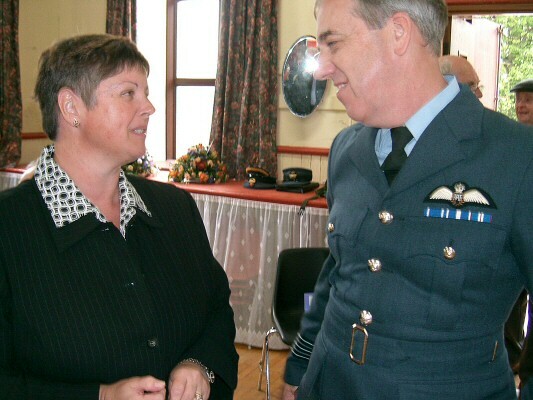 It was a privilege to fly with him and an honour to be a member of the crew in which he served.